Turn off to temporary disable all printings to this printer. Every printer has different width and dimension. Column is the number of character that could be fit into the printing paper. Reduce column count if characters are overflowing to the next line. Printer IP address should be obtained from printer. First turn off the printer, click and hold on the feed button then power on the printer while holding the feed button on the printer. A configuration sheet with IP address will be printed out. For non ethernet interface printer, IP address will not be seen in the configuration sheet. Port number should be 9100 by default for ethernet port printer. For bluetooth printer, upon selecting the printer model, necessary port information will be filled in. If printer model is not listed, try using Epson TM-T81 as printer model. For Star printer, select TSP-100 as printer model. Divert Printer - Docket printing to kitchen will divert to another printer if it fails. Buzzer Code - At the end of each cut, a buzzer code will be sent to the kitchen printer if there is an external buzzer attached to the printer. Use '7' as buzzer code for Star Printer and '27 112 0 25 250' for the rest. 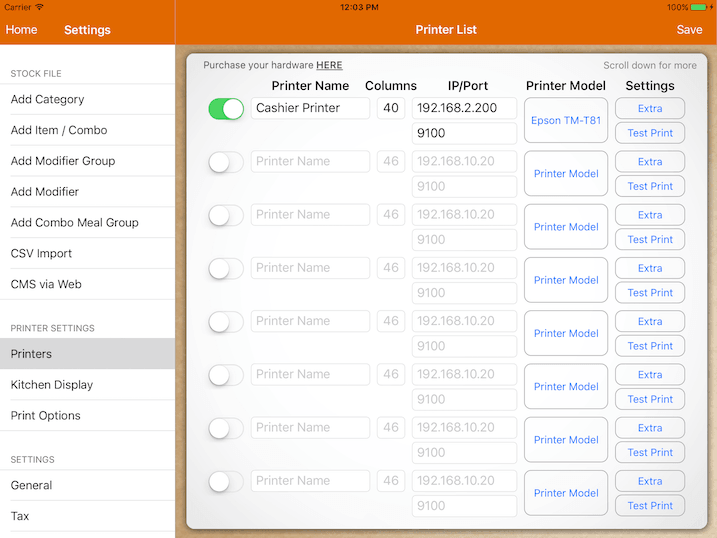 Split Order List by Item - You can specify certain printers to print order docket cut by each order. For example, kitchen printer would split for each order but bar printer is not required. Test print will print out a sample receipt and pop the drawer.